Back in January, General Motors CEO Mary Barra claimed that her company had sold over 200,000 electric vehicles without having to replace a single battery pack. It turns out not only was that incredibly misleading and false, but one unlucky Chevy Bolt owner even had to replace their battery not once, but twice. Bolt owner and journalist over on InsideEVs Bradley Berman has extensively outlined a timeline of of his troubles with his car’s battery, including an interview with GM’s chief engineer of electric propulsion systems about why his Bolt was having so much trouble. A month after receiving the car in June of 2017, Berman claims the car just stopped and left him stranded on the side of the road. Later that month, GM replaced the battery with just 1,746 miles on the clock due to a low-voltage problem with one of the pack’s cells. 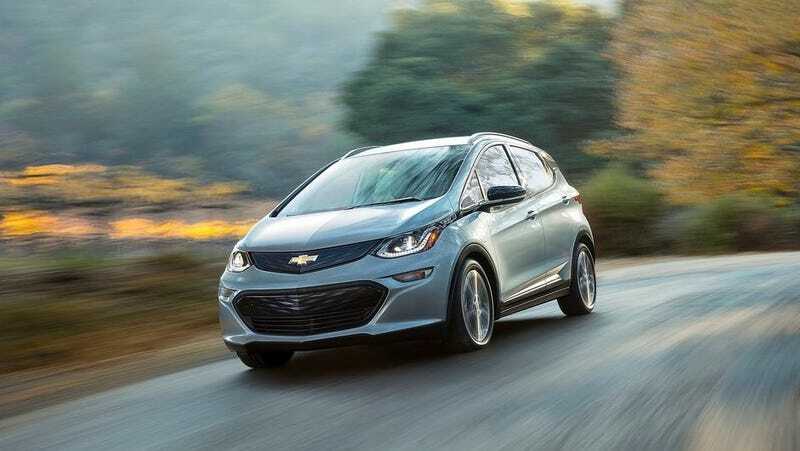 GM claims approximately 100 other Bolt owners could potentially face a similar issue, and that the company has altered the supply chain with LG Chem, the battery supplier, to prevent the issue from spreading to newer production cars. In April of last year, GM issued a recall for 2017 Bolt owners to come in and get a software patch that would improve the reporting of potential cell issues through the car to the driver earlier, and allow the car to operate in a limp mode if an issue did occur to prevent people from being stranded dangerously. More software updates in May of 2018 were implemented to better warn of issues and accurately report range. ﻿Nov. 20, 2018: In a post on InsideEVs.com, I report detailed range numbers about a 184-mile late trip that reveals my Bolt’s battery capacity is reduced from 60 kilowatt-hours to about 35 kWh. Berman was then informed his Bolt’s new issues lead to more changes between Chevy and LG Chem in the battery manufacturing process. Soon after Mary Barra’s statement that no GM battery packs have had to be replaced, Chevy communications was forced to clarify that, “Mary’s original statement was in reference to the wear out of a battery due to regular use. Upon further review, an estimated less than 0.01% of customer battery packs or sections have been replaced due to suspected wear out,” according to Berman. Berman and Grewe go into much more detail about the timeline of events and the issue with the car’s battery packs in the full article over on InsideEVs, so be sure to check it out. Jalopnik reached out to Berman about his story and will update if he gets back to us. What essentially happened, according to GM, is anomalies in the manufacturing of the battery packs caused specific cells in each pack to falter, crippling the capabilities of the entire pack. While the issues technically were a result of wear on the cells, the packs should have been manufactured to last much longer without failure. But according to Grewe, Berman’s Bolt is the only one that’s had it happen twice, and hopefully he’s the only one it happens to.